This gown goes with a story I’ve been working on for Halloween, but it’s not done yet, so for now you just get this half of the project. Wish me luck and I will do my best to get the story done soon. How pretty! I love the green, it really makes the outfit. I love this dress and I would totally war this. I almost gave up on you, but thougth that you would not desert us. You are my absolute favorite paperdoll artist. So enchanting! I adore the pearl-like detail on the skirt! If Halloween weren’t so close, I’d make a costume to look like this dress. I love it! Don’t worry about being late, if i was doing this the same thing would happen. (I have procrastination problems!!!) Happy for a story to look forward to though. Even the filler dresses are awesome!! I can’t think of enough ways to say I love this dress… How about “I want to wear this at my wedding”? I love the way the green ties everything together and I love the embroidery on the sleeves and skirt. Its sooo pretty and we’re glad you’re back! I love this gown its so pretty! I think the green is fresh but what really makes it is the all the gores in the skirt. Definitely could see twirling in this dress. I agree with everyone; the green is really the part that makes the dress. It’s really beautiful. Your dresses are just gorgeous! 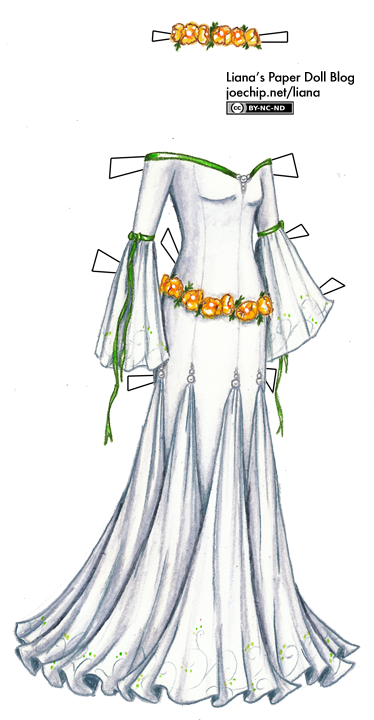 I love paper dolls, especially ones with beautifully-drawn, fantasy-themed clothes. I’ve had a paper doll collection for years. I look forward to seeing even more of your designs! Amazing!!!! I like the orange flowers! Is your last name really Kerr? Did all that time you were working on this??? Liana’s back! You just made things so much better, I’ve had a hell of a couple of weeks. And the dress is absolutely beautiful, I’ll try and be sure to have your bat costume colored by Halloween! For a while I thought you were leaving me. Really. i came back ever day till you posted. I was sooo happy! i LOVE the dress. Its one of my favorites!